Nationally, there are approximately 2.4 million vehicle-deer collisions causing $5 to $8 billion of damage each year. During a fiveyear period in Nevada, nearly 2,000 automobile-animal collisions were reported with an additional 50 to 71% more unreported. Research conducted by the Nevada Department of Transportation (NDOT) and Nevada Department of Wildlife (NDOW) showed that a section of US 93 in Wells, NV, crosses through a seasonal mule deer migration route, resulting in one of the state’s largest vehicle-deer collision rates. In order to enhance the safety of both the wildlife and traveling motorists, NDOT needed an overpass structure. 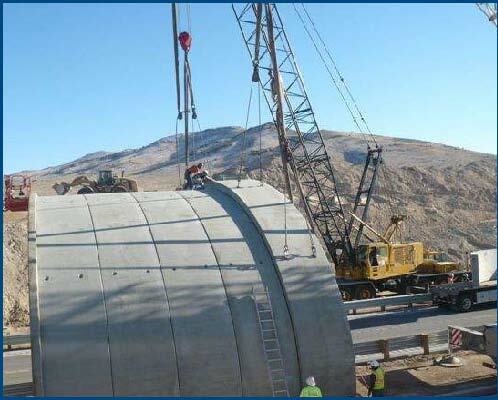 NDOT chose a 66’ x 23’ BEBO® precast concrete arch system as a low impact development and cost-effective solution. The system includes precast headwalls and wingwalls which retain the soil around the arch. The structure, 162’ in length, was designed to allow vehicles to pass through on the highway while providing a semi-natural corridor above for wildlife. Three miles of fencing surrounding the area encourage wildlife to use the overpass in lieu of crossing the road. In addition, the top of the structure was covered with earth and native vegetation to replicate the natural environment. Research by the University of Nevada, Reno, Department of Natural Resources and Environmental Science shows that during the first two migrations after the installation of the safety crossings, more than 7,000 mule deer were kept off the road and away from potential vehicular collision. The project was a partnership between NDOT, NDOW and local groups. NDOT oversaw construction of the overpass structure, while NDOW provided fencing and the earth and vegetation to cover the crossing. Additional community groups also provided vital project support. The approximately $2 million project was funded in part by federal economic recovery funds.